Card Games, especially poker, has always been really popular among casino players. There’s something that attracts all sorts of people do casino poker games. I’ve actually seen professional poker players (club poker ones) that also gamble it up playing casino holdem, even though they are well aware of the house edge. That’s just part of being a gambler to make a living, I guess. Anyhow, Casino Holdem is actually one of the most popular forms of table poker that is played against the house. There’s also similar forms like Caribbean Stud Poker and a couple of others, but this article will be devoted to this game in particular. ”Ante” – place to make your initial wager, before any cards are dealt. ”Call” – after two cards have been dealt to you, as well as 3 on the board (known as the flop), you have the option to either ”fold” and give up your hand or alternatively ”call”. The latter can and should be done, if your hand is somewhat strong and there’s a chance that you’ll have an ever better one after two extra cards are dealt. So to sum it up, when the ”call” button is clicked, wager equal to double the ante bet is placed and two last cards (also known as the turn and river) are dealt. This is where the showdown occurs and hands are compared. Basic poker hand rankings chart is used to do this. If you hold a better hand than the dealer, a payout is awarded. There’s a specific payout chart for the ”Ante” bet as well as AA bonus too. ”AA Bonus” – additional side bet that can be placed. You’re placing a wager that suggests that the next hand you are dealt will be equal or stronger than a pair of aces. There’s also a separate payout chart for this bet. So that’s about it regarding the gameplay in Casino Holdem, but there’s a couple of extra things we’d like you to know too. One very important aspect is the rule of qualifying for dealers hand. For dealers hand to be considered as ”qualifying”, he has to have a hand that is equal or better than a pair of fours in strength. Note that this is also true, when the board is paired – dealer instantly qualifies if this is the case. The dealer does not qualify – your ”ante bet” is paid according to the pay-table, while the ”call bet” is pushed. Dealers hand qualifies, but your holdings are better. In this scenario ”ante bet” pays based on the payouts listed in pay-table, while ”call bet” is paid at even money odds of 1 to 1. The dealer holds a qualifying hand, but it’s equal in strength with your holdings. In this case all bets are pushed – neither lost, neither are any payouts awarded. Worst scenario is, of course, when dealers hand qualifies and beats your holdings. If this is the case, you lose both bets. You should always remember that only your ”ante bet” will qualify for a payout according to the paytable. Well, the only exception to this is the ”AA Bonus”, which also features its own paytable. Remember that ”Call Bet” is always paid at even money odds, if you win and the dealer holds a qualifying hand. There are no payout odds applied to this wager. Take a look on the pay-table for both, ante wagers and bonus wager. You should always call with two overcards in relation to the board. You should fold, when the board is paired and you have J high or worse with no chance of making a flush or straight. Always fold low cards that haven’t made a pair or any kind of a draw. 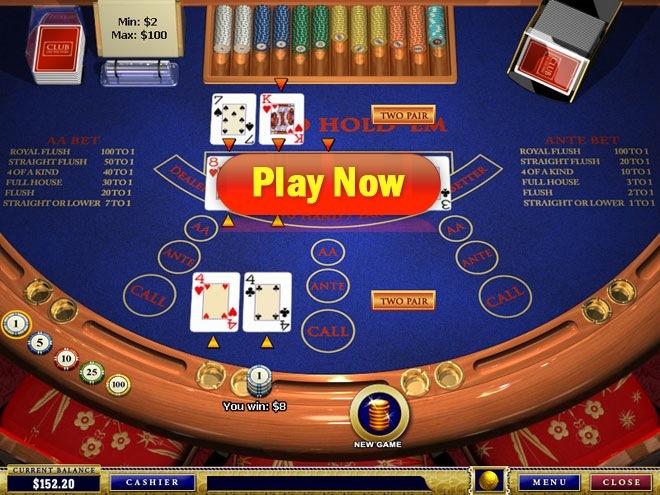 Now, when you have educated yourself about the rules and optimal play of Casino Holdem, it’s try to give it a try. While we don’t offer a free version of this game, Winner Casino has cooperated with us and we can offer you $/£30 in FREE credits! There’s no hook or small print for this offer – simply sign up at www.winner.com and your account will be instantly credited with cash that can be used to give this casino poker game a try! JOIN NOW – CLICK HERE!